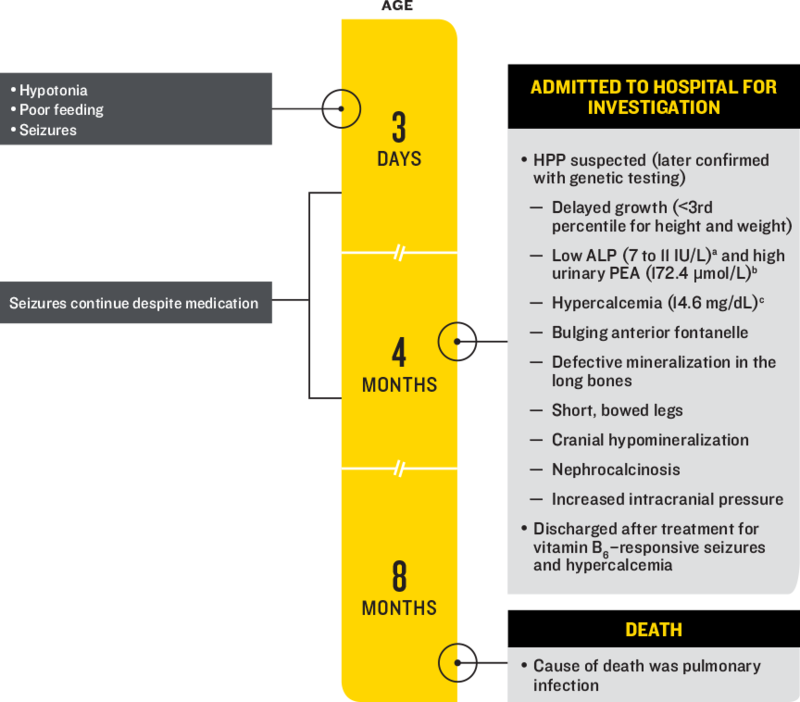 An infant with seizures and other systemic manifestations of hypophosphatasia dies before 1 year of age. Based on a published case study: Demirbilek et al, J Clin Res Pediatr Endocrinol, 2012.
aNormal ALP reference interval used by the laboratory in this case study was 150-240 IU/L. Please note that reference intervals can vary among laboratories. bNormal PEA reference interval used by the laboratory in this case study was 0-10 μmol/L. Please note that reference intervals can vary among laboratories. cNormal calcium reference interval used by the laboratory in this case study was 8.5-10.5 mg/dL. Please note that reference intervals can vary among laboratories. Demirbilek H, Alanay Y, Alikasifoglu A, et al. Hypophosphatasia presenting with pyridoxine-responsive seizures, hypercalcemia, and pseudotumor cerebri: case report. J Clin Res Pediatr Endocrinol. 2012;4(1):34-38.